Inshore- Mackerel are showing up early this year and we have TONS of white bait around the pass. The snook are in the passes and on the beaches too. This past week some big snook were caught from the north Jetty of Johns Pass by Mahlon Washington and his buddies using swim baits and flair hawks on the outgoing tide just before sunset. The birds, bait, dolphin and fishing action around the pass and just off the beaches right now is very active. This past Tuesday night I was on the beach watching the sunset with my wife and I witnessed multiple guys catching snook and a few nice jack crevalle while the bait flushed out of the pass being chased by fish, dolphins and birds. Our bait guy Brian Harris from Pinellas Park has been filling coolers with nice sized mackerel just past the surf working the bait schools past the swim buoys. The big speckeled trout right now are pretty active inside the pass around the flats hitting the plentiful shrimp and white bait that are moving through the passes on this recent new moon tide. 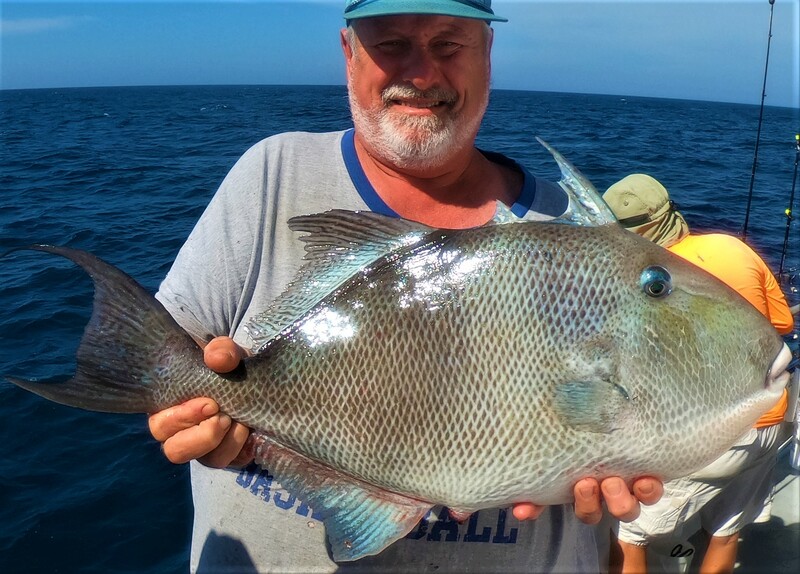 The sheepshead are still around the passes too with plenty being seen caught on fiddler crabs and pieces of shrimp around the structures of Johns Pass and the jetties. It’s a great time to get out and enjoy the beautiful weather, clearer waters and great fishing going on right now at most any pass including our very own Johns Pass. 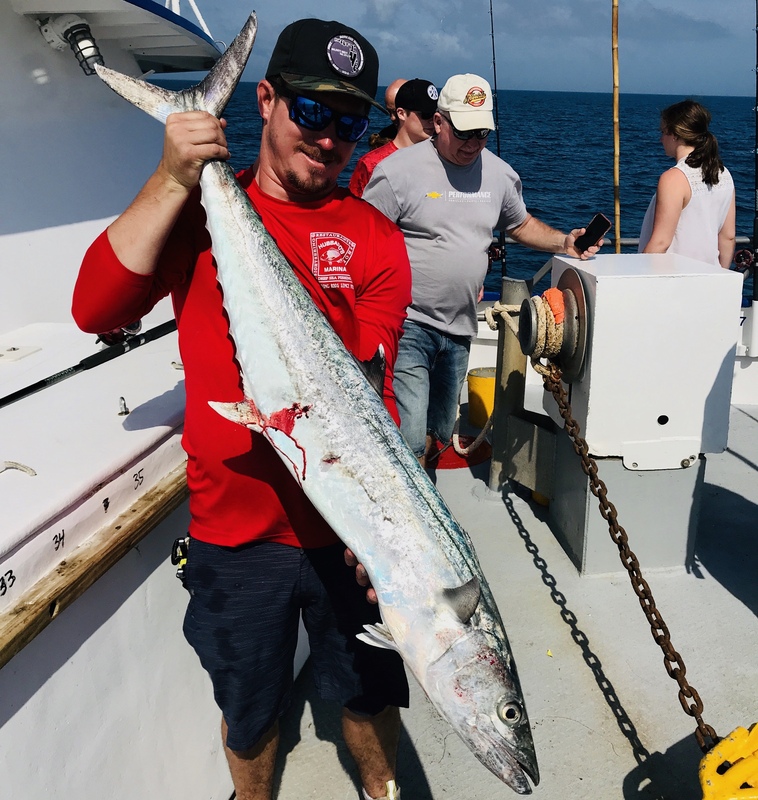 Near shore- Kingfish are back in town for spring break and it’s making our half day and all day party boat fishing even more exciting for passengers and crew alike. We are seeing nice 10-30lb kingfish smoking the flat lines and smashing our trolling plugs and spoons on the way out and back offshore. Plus, the hogfish bite has been great this week this past week on the live shrimp and fiddler crabs. We caught one of the largest hogfish I have seen on a half day trip this past Wednesday with Capt Dave Singletary using a live shrimp with a 4ot hook and 30lb fluorocarbon. The grey snapper or white grunt action has been a little hit and miss, we are having to travel further to 12-14 miles on our half day trips lately since that red tide at the end of 2018 the fishing near shore from 6-10 miles really hasn’t recovered well and were still having to go further than normal to get into the quality action we were used to pre-red tide. However, once you get deeper past 40ft of water beyond 12 miles the fishing has been great recently on lane snapper, hogfish, mangrove snapper, and MORE! BAD NEWS: We have some seriously shortened seasons on the horizon for 2019, Amberjack’s May season will NOT BE OPENED! Jacks will only be open August-October 2019 and not include the spring May season. Triggerfish will also be closing sometime in May and NOT RE-OPENING anytime in 2019! This comes as a huge surprise and is super frustrating, the whole idea of the new amberjack season was to have at least some spring component. However, since the fishing year opens August first and ends May the following calendar year our August, September and October 2018 fishing year landed the full quota so may 2019 will not be re-opening. 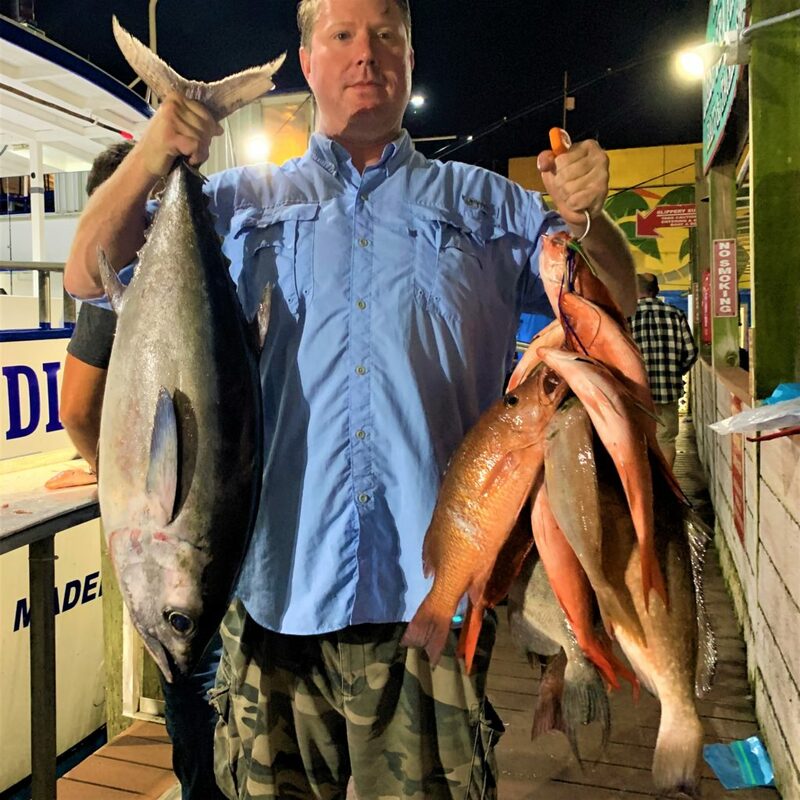 However, August first 2019 we will for sure open because it’s the start of a NEW fishing year for amberjack thus we start with a brand new full quota and HOPEFULLY that will allow for a spring MAY 2020 season! DON’T SHOOT THE MESSENGER, we just wanted our anglers to know ASAP before the final announcement is made in a few days! I will be attending the April gulf council meeting in Biloxi, MS to voice our disdain for this 3 month fishing season for jacks and lack of a spring component! We have another great Bass Pro Shops seminar coming up THIS Saturday March 16th at 2pm if you want to join Capt Dylan for a chance to win FREE FISHING TRIPS! The fishing seminar or fishing conversation will be about an hour long of fishing conversation, tips, tricks and more! Plus, at the end of each seminar Capt Dylan gives away a FREE 10 hour all day for two guests and a FREE 5 hour half day for two guests to two lucky winners of the FREE raffle. To be entered in the raffle you just have to show up around 2:30 pm and stay for the hour seminar. Check out the Facebook event for this upcoming seminar here – https://hubbardsmarina.com/bass-pro-fishing-seminars/ You can also view all the past bass pro shops seminars at this page too! We have entered our busy spring break season here at Hubbard’s Marina. Due to that, we want to encourage all our guests to make sure you book your trips ahead of time and arrive a little earlier for your trips. Especially if you have a trip leaving between 11am-7pm since the traffic and parking all takes a little longer this time of year. When your leaving after your morning trips you will have to deal with this type of traffic congestion on you way home too. Please be advised our beaches are filling up due to the gorgeous weather and all the fun in the sun options we have around Johns Pass, Madeira Beach here at Hubbard’s Marina. Water is super clear right now in our back bay waters thanks to the super nice and calm weather we have been having and light winds. The water is not stirred up in the slightest and the cooler temps keeps the algae down which allows for some of the clearest water conditions of the year in our ‘spring time’ when water temps are in the mid 60’s to mid 70’s and the weather is nice this time of year it gets crystal clear in the bays and along the passes and on the beaches making it a great time to do a dolphin watching nature cruise and eco tour with us or our famous sunset cruise that offers FREE beer and wine! Along with the playful large groups of dolphins, we have our local bird nesting island called dog leg key which we cruise past during our dolphin watching nature cruise and eco tour is a beautiful sight this time of year as our local seabird population starts to dawn their mating plumage. As the local seabirds prepare for mating season they get very colorful and decorative plumage or feathers and it makes for a super special viewing experience this time of year aboard our dolphin watching nature cruise and eco tour! We have finished 2019 regular’s club renewals and we are starting on signing up NEW MEMBERS, if you are interested in becoming a 2019 regular’s club loyalty program member please reach out to Capt. Dylan Hubbard by sending him your name and cell number via email to [email protected]. He will be in touch in the coming few weeks about the loyalty program that offers discounted trips if you fish more than 10,15 or 20 times a year with us at Hubbard’s Marina. It also comes with some free gifts and other benefits too besides discounted trips, but it’s NOT simply a discount program. It’s a loyalty program and it requires fishing often and being a model Hubbard’s Marina guest and showing the passion shared by all of us at Hubbard’s Marina for fishing and our fellow anglers. PAST AND PRESENT MEMBERS: be sure to renew your membership before 2018 ends! 2019 Hubbard’s Marina fishing calendar’s FREE while supplies last! Steamed in butter, white wine, lemon and garlic. Served with grilled Tandori bread. A fresh Salmon fillet broiled and topped with our own spinach mixture and hollandaise sauce.